On July 29th, the Massachusetts Legislature voted to restore a number of funding priorities to the FY16 State Budget which had been vetoed, including funding impacting the Reinvent Cogswell campaign. Senator Kathleen O’Connor Ives and Representative Linda Dean Campbell worked to secure $60,000 in the FY16 State Budget toward repairs to prevent additional deterioration to the historic building, Cogswell School, located at 351 S. Main Street in Haverhill, Massachusetts. When this item was vetoed, legislators then voted to restore funding for this and other important local priorities to the budget. Now, with $60,000 directed toward continuing the momentum of Reinvent Cogswell, progress can continue. Relatedly, both the MA [Massachusetts] House and Senate successfully voted to overturn Governor Charlie Baker’s arts veto, restoring $2.3 million to the Massachusetts Cultural Council. This vote brings the Massachusetts Cultural Council budget back to $14.16 million, the largest increase in state investment in the past 9 years. [Quote] “The Reinvent Cogswell Team are so deserving of our gratitude from our entire community! Their vision and commitment are truly inspiring. This building will bring our community together in support of local art and will benefit the entire region.” Said State Representative Linda Dean Campbell. 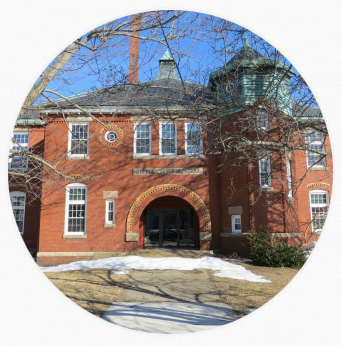 In 1891, the George Cogswell School opened its doors to the community and served Haverhill for over 100 years. Reinvent Cogswell hopes to reopen these doors again as a center for community arts and cultural activity. We are one step closer to this reality. Creative Haverhill and Reinvent Cogswell would like to extend our sincere thanks to State Senator Kathleen O’Connor Ives and State Representative Linda Dean Campbell, for their support in obtaining funding for the Cogswell School in the 2016 Massachusetts State Budget. We would also like to thank State Representative Brian Dempsey for his support of the Massachusetts Cultural Council, proud supporters of Creative Haverhill through the Adams Program. This project is fortunate to have their support. Reinvent Cogswell, an initiative of Creative Haverhill secured a competitive lease with an option to purchase the building from the city earlier this year, however, the building cannot be occupied in its current state. Immediate repairs must be made to the building’s roof and systems. Water damage has caused breaks in the plaster ceilings, warped floors, and environmental concerns in the building’s basement level. Additionally, the building’s heating system is inoperable and must be addressed before the upcoming winter. The funding received will begin to address issues that were assessed during the building feasibility study, funded in part by the Massachusetts Cultural Council last year. Working with local architect, Angelo Petrozzelli, who specializes in historic preservation and public spaces, Reinvent Cogswell hopes to restore and preserve the school. Future plans include a fully accessible building. The vision includes flexible gallery space, private and public studio spaces, as well as community space with a focus of creativity. Reinvent Cogswell is seeking additional funding to complete added repairs and upgrades necessary to bring the building to code. “While it is hard to resist thinking about all of the programing possibilities, we continually remind ourselves that our focus must be on the building at this moment. We are incredibly grateful for the support of Senator O’Connor Ives and Representative Campbell as we continue this phase. Just one town away a similar school is being demolished after it fell into disrepair. Cogswell has no working heat. This coupled with a leaking roof and it isn’t hard to imagine a similar fate. We are committed to Reinventing Cogswell and happy to steward the process,” said Danielle Smida, Chairperson, Creative Haverhill. Creative Haverhill supports Haverhill arts and culture, providing experiences and access at the intersection of art, culture, and community and the development of high quality spaces as platforms for community and cultural expression. The non-profit aspires to broaden Haverhill’s exposure to the arts and enrich community life, striving to create new and highlight existing cultural experiences, fostering creative expression throughout Haverhill, engaging new audiences and bringing cultural experiences to the Riverfront Cultural District. The Massachusetts Cultural Council (MCC) is a state agency that promotes excellence, access, education, and diversity in the arts, humanities, and interpretive sciences to improve the quality of life for all Massachusetts residents and contribute to the economic vitality of our communities. The Council pursues this mission through a combination of grant programs, partnerships, and services for nonprofit cultural organizations, schools, communities, and artists.